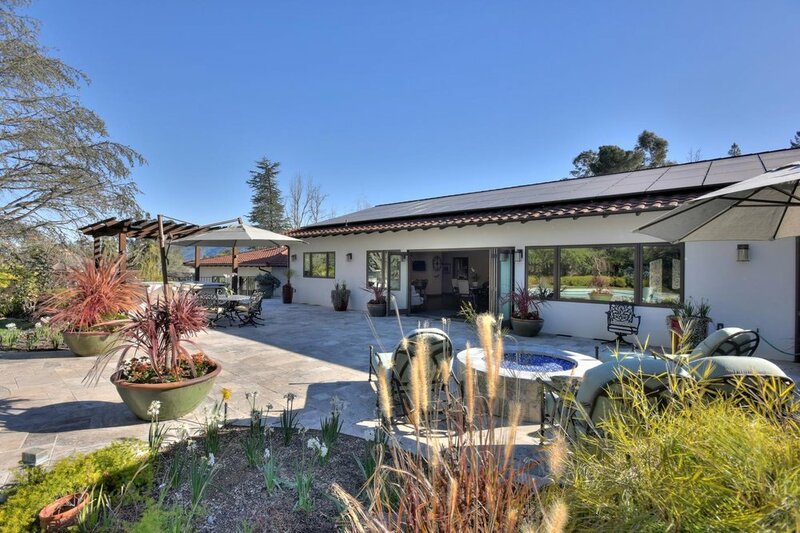 Impeccable custom home on almost an acre of level landscaped grounds with a vineyard and resort-like pool/spa. 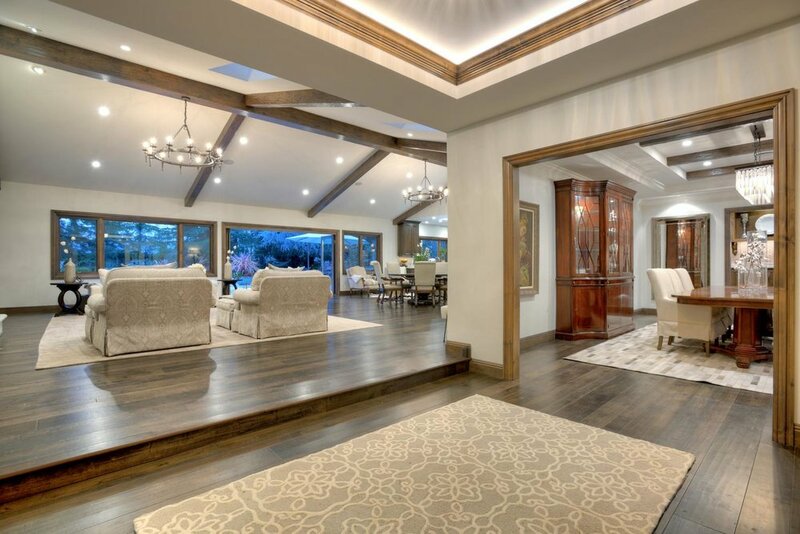 Redesigned by renowned architect, Chris Spaulding, this luxurious home was expanded and rebuilt in 2014/15 and embodies classic style and elegance, with meticulous attention to craftsmanship, design detail and high-quality amenities. 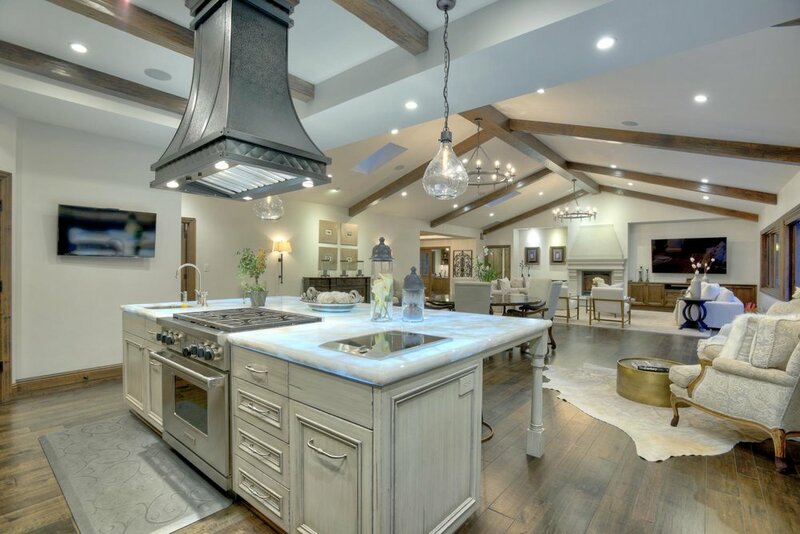 The home offers a spectacular great room with gourmet chef’s kitchen, an opulent Master retreat, a large second bedroom suite, an impressive butler’s pantry, a media/game room with wine cellar, an executive office, luxurious bathrooms and more! The great room extends indoor living to the incredible outdoor travertine patio with a sparkling pool and spa, fire pit lounge, BBQ kitchen, gazebo and detached fitness studio. 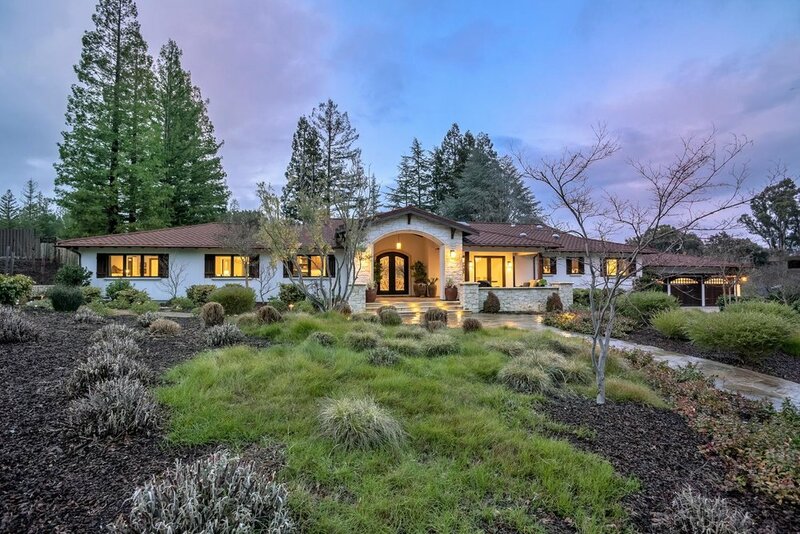 Located on a tranquil cul-de-sac with mountain views, close to lively downtown Los Gatos, shopping, dining and top schools, this incredible home offers unsurpassed luxury and ease of living! 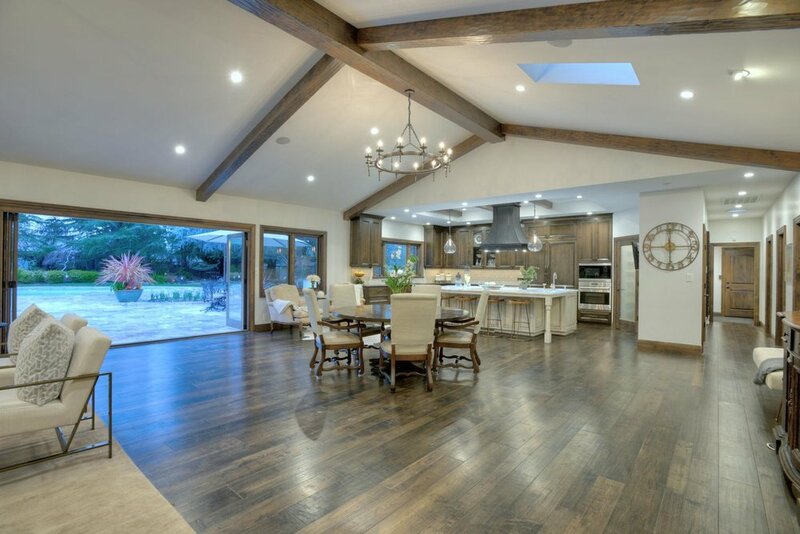 Spacious open concept living spaces are enhanced by soaring ceilings. 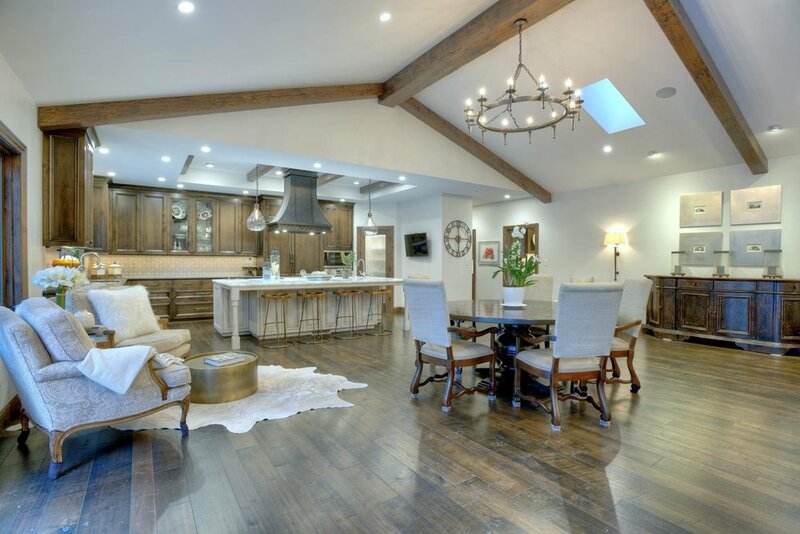 Rich, warm Alder wood finishes throughout the home, including hardwood floors, crown molding, solid doors with expressive knots, and hand-scraped exposed beams, create a luxurious, inviting ambiance, complemented by old-world textured walls. Other high-quality finishes include Kolbe windows, designer light fixtures, cutting-edge marble, travertine, quartz and limestone finishes, plus top-of the line appliances, full-extension soft-close Blum cabinet hardware, oil-rubbed bronze fixtures, smart home lighting, whole home speakers and owned solar powering the entire home. 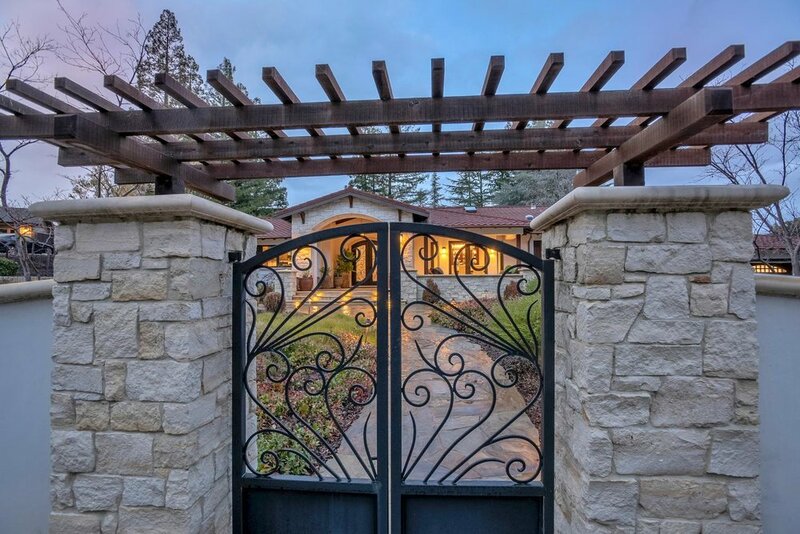 Enter through Decorative wrought iron gates flanked by pillars, flagstone pathways, trellis accents, an expansive driveway and landscaped gardens with vineyard plantings, all beautifully frame the eye-catching custom-arched glass and wrought iron front entry door to the home. Off the main entry, an elegant formal dining room is crowned by a sparkling Restoration Hardware chandelier and a tray ceiling with hand-scraped exposed beams. Bay windows flank French doors that open to the covered front porch lounge area. The impressive butler’s pantry is well-appointed with a wine refrigerator and beverage station, a built-in La Spaziale Vivaldi II coffee maker, utility sink and Bosch dishwasher. This room is accented with leathered granite countertops, raised panel upper and lower cabinets with glass displays, a silver marble subway tile backsplash with diamond mosaic inlay, concealed outlets, plus a sun tunnel and LED under mount strip lighting. 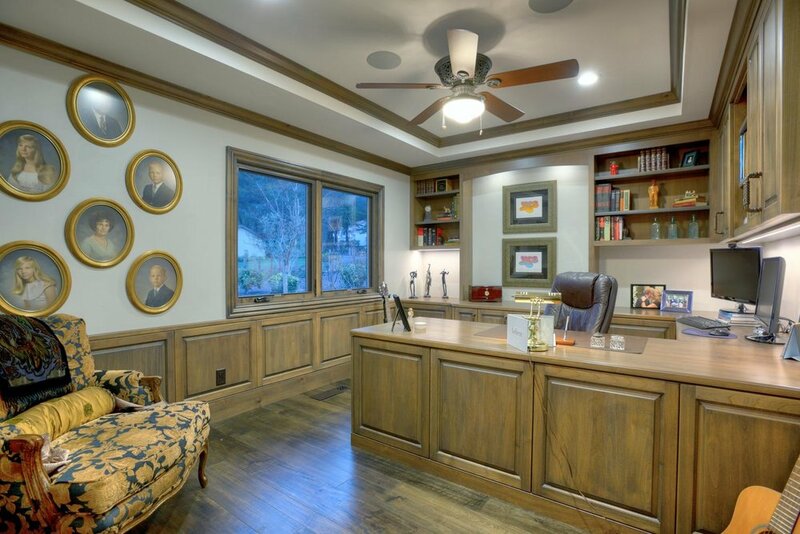 The executive office located off the main entry features glass-paneled French Doors showcasing its beautiful Alder custom built-in cabinets, shelving, desk and wainscoting finishes. The breathtaking Great Room is crafted with dramatic architectural elements and thoughtful design detail. 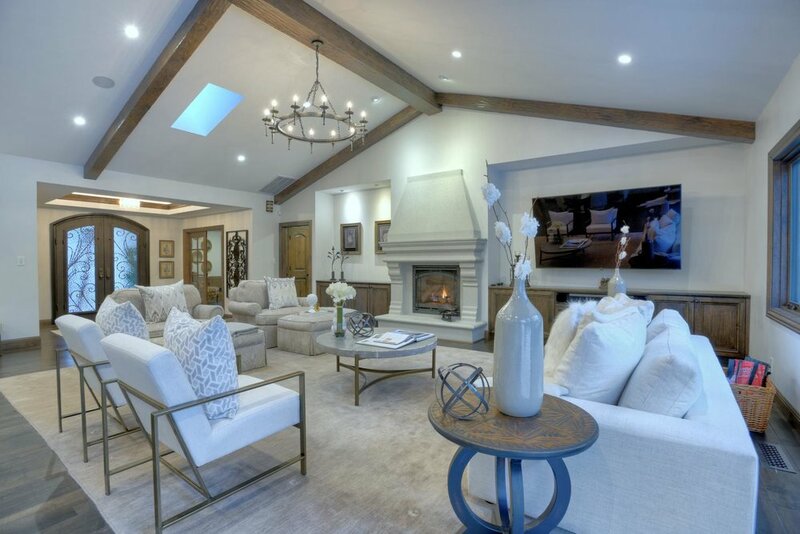 Soaring vaulted ceilings adorned with hand-scraped exposed beams, Restoration Hardware chandeliers, skylights with remote controlled blinds, and a wall of windows and doors all create stunning visual elements and accentuate spaciousness and light. A remotely operated gas log fireplace with a cast limestone mantel framed by recessed built-in cabinets highlights the main living area, with an adjacent casual dining space and chef’s kitchen. 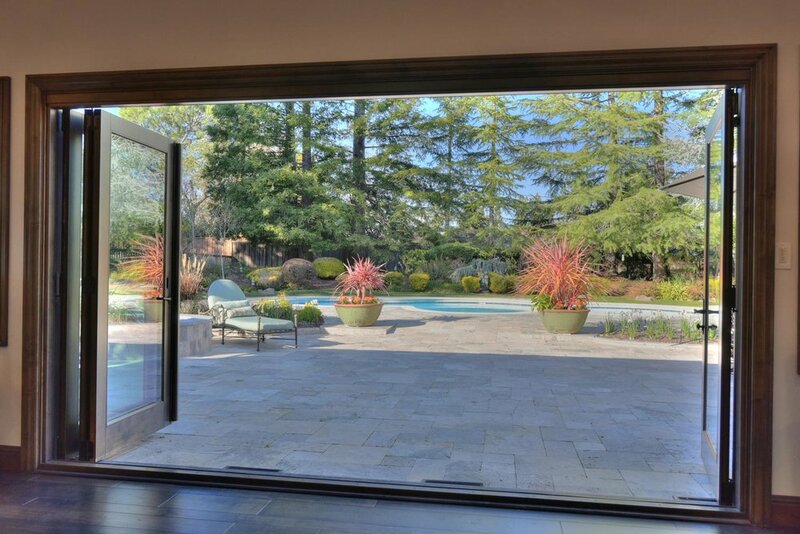 This room also features Lutron mood/scene lighting, and bi-fold doors that overlook the dazzling backyard pool and patio, and seamlessly extend indoor living to the outside. The gourmet kitchen will delight the home chef with its top-of-the-line stainless steel appliances including a Wolf 6-burner oven range, wall oven, microwave and warming drawer, and a Miele induction burner, Fisher & Paykel dishwasher drawers, and Subzero Integrated Column refrigerator and freezer. Beautifully crafted, the kitchen also features a custom range hood, walk-in pantry with rainfall glass door, recessed panel cabinets, leathered granite counters, Blum hardware, stainless steel sinks with luxury satin nickel Waterstone faucets, a backsplash with etched Botticino honed gray-black stain tile, and a large island with glazed cabinets, counter seating space, pendant lights, and a dazzling quartzite countertop with an undermount LED backlight panel activated by a dimmer switch. 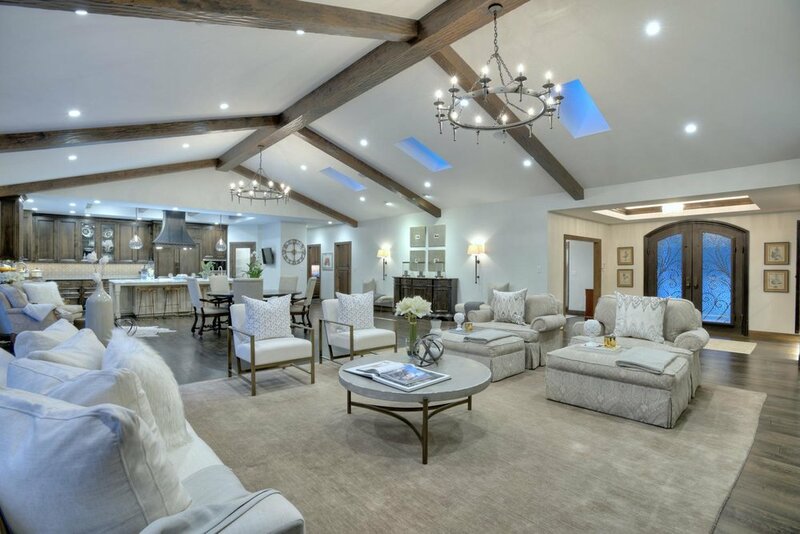 The spacious Master retreat features a sitting room with French doors to the backyard pool and patio. New carpet and decorative tray ceilings with crisp white crown molding outline the spaces and create a cozy ambiance. Accented with a barreled tray ceiling and luxurious crema marfil marble floor tile, wall tile and countertop finishes, the spa-like en suite boasts a spacious double sink storage vanity and a large shower with overhead skylight, frameless glass door, dual shower heads and an eye-catching Walker Zanger honed Calacata mosaic inlay. His-and-Hers walk-in closets are fitted with custom California Cabinets organizers. Attention to detail continues along the main bedroom wing hallway, which features a distinctive ceiling with 3 cove-shaped tray inlays. The main hall bathroom is beautifully appointed with a limestone double sink storage vanity, additional storage cabinets and a shower/tub combo with frameless glass doors and Waterjet travertine tile accents. This spacious bedroom with a built-in closet and tray ceiling features its own en suite with a walk-in silver marble tiled shower and floor, penny-round mosaic tile accents and a single sink storage vanity with a quartz countertop. An additional bedroom located in the main bedroom wing has a decorative tray ceiling, new carpet and a built-in closet with mirrored doors. The 4th bedroom, with hardwood floors and a built-in closet with etched glass doors, is located in a separate wing of the home and could also be configured as a guest room. The auxiliary hall bathroom doubles as a pool bath, with an etched glass door to the backyard patio. It features a quartz single sink vanity with a Hubbardton Forge sconce and a frameless glass shower with Metro gray vein-cut honed limestone wall tile, and natural brushed limestone floor tile. A recent addition to the home, this spacious room is highlighted by a 10 ft. ceiling and 670 bottle temperature-controlled wine cellar. This room also features a storage closet, A/V wiring, its own dedicated a/c zone and a sliding glass door to the pool patio. 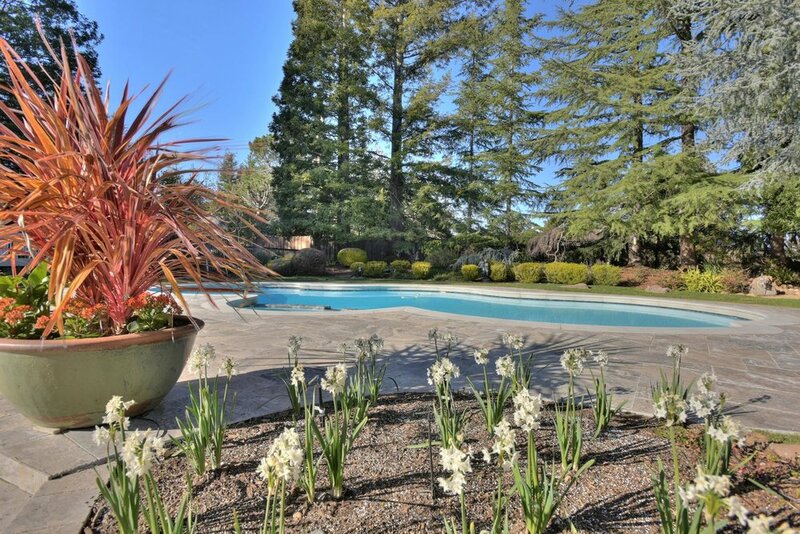 Beautifully landscaped grounds by Thom Scher and vineyard ready area with a private backyard resort-like pool and living area. The recently repainted and freshly tiled heated pool and spa is surrounded by a Versailles-patterned silver travertine patio offering plenty of room to dine, lounge and entertain. An outdoor kitchen is equipped with a Lynx BBQ and side burners, and a Turbo refrigerator, with a Pietra Serena counter space. The lush, landscaped backyard also features a Koi pond, gazebo, built-in fire pit, fitness studio and gardener’s greenhouse/potting shed. The laundry room offers plenty of workspace and storage with upper and lower cabinets, a utility sink and leathered granite counters, accented by a Metro silver marble backsplash. This room also houses an ice-maker. A sun tunnel adds extra natural light to the space.